Believe it or not, this is the Lord’s prayer – the form for prayer that Jesus taught his disciples. In this image, it kind of looks familiar and kind of draws attention but we kind of don’t really get what it’s about. And perhaps that’s just like prayer: as easy as speaking to our Father, mentioned in so many Christian conversations, but not something in which we ever feel mastery. 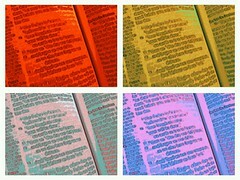 I decided we’d look at prayer in our family Bible reading. Using the Lord’s prayer, as recorded by Matthew. Here’s how we did it. Each evening, after dinner (that’s our usual time), I read Matthew 6:9-13. We then discussed one line of the prayer. Then we prayed it together by reading the Bible passage. The next night the pattern was repeated as we moved to the next line of the prayer. By the end, even our youngest non-reader was making a stab at saying the words of this prayer. To finish the sequence of prayer devotions, we read Matthew 6:5-8 to hear Jesus’ warning about using prayer as a pathway to pride. By this stage we knew the words of the prayer … well, perhaps our five and seven year olds had less accurate recitation! 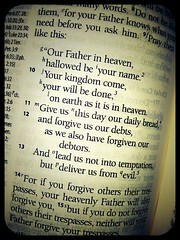 Here, as far as I can recall, is what I highlighted for each line of the Lord’s prayer. It’s not written in the conversational dinner-time style, but the points are what we talked about. Prayer starts with God, the Father. We speak to him – we don’t send him a memo or an invoice. He’s Father! What’s more, all who trust him do this, God is our Father. Prayer, then, is a kind of family activity in which the children seek out the Father who is the giver of life. This is very worthwhile, because he is our Father in heaven, the place of real authority – he is the power above all. What’s in a name? A person’s character and reputation, that’s what. The name is the whole message and expression of God. And because it’s a word, it is communication. God’s name is spoken to people and received by people. When God’s name is spoken truly, people know God properly. God’s name, in a sense, is all of creation rightly listening to him. That is, God is hallowed, known as holy. That’s exactly what we want to see. So we ask for it. God’s kingdom is not a space on a map. It is God’s rule, unchallenged and right. This line reminds us that God is the only ruler – I am not the king! It’s important to see that these two requests follow on from ‘Our Father in heaven.’ The Father, in the Bible, is responsible for the family. Sometimes even kings are called ‘father’ of their nation. And the kind of king/father we have is holy, because he’s in heaven. There’s a third prayer request for something about God. What should we pray for as of first priority? For God’s rule and will and ways. The first good thing about prayer is that it rejoices in God’s name, kingdom and will. Yet there’s a shadow in this prayer. To make these three requests is a reminder: God’s name is treated as mud, his king is ignored, and his will is flouted. This world is not right. So sad! What can be done!? Major news: Jesus shows that God uses prayer as he fixes this world. It’s a mystery how God does this. But we know what we need to know – that prayer, like the Lord’s prayer, is good in a world that does not yet do God’s will. We can be confident in all these prayers, because Jesus prayed the same thing – three times! (Matthew 26:36-45) And God answered this prayer, through the cross of Jesus. God’s will was that the death of Jesus forgive us of sin. Certainly now God will hear our prayers, for we are his children. God loves us, because he’s our Father. No detail is beneath him. Our bread is a day by day need. Our bread is also a day by day prayer point. At the same time, this is a prayer that skewers greed. Instead of asking to own 1000s of bakeries, we ask for the day’s food. That’s plenty, for we will let tomorrow worry about itself. Debts are what we owe. They’re expensive, and it’s right to pay. The trouble is, we cannot pay our debt to God because our wrongs are so many. All we can do is ask for God to wipe away the debt. But there’s more! We ask for forgiveness as we also forgive. Forgiveness, we see, is central to God’s kingdom. Everyone in God’s kingdom is a person of forgiveness: we love it. We love forgiveness from God, we love to show forgiveness to people, we love to encourage forgiveness between others. Everyone who loves God’s kingdom loves forgiveness. Now look at when we ask for forgiveness: it’s after we speak to God as Father. We were already God’s children, as disciples of Jesus. We do not flip-flop into God’s family and out of it depending on ‘sins.’ When we trust Jesus, we are always in God’s family – always – though we will have to keep coming to God for help with our debts. We see that prayer for the whole world is also prayer for me and for us. We will be changed by God, as we pray in the manner Jesus taught us. This entry was posted in Bible, Family, Ministry and tagged Lord's Prayer, Matthew 6:9-13, Prayer on 4 February, 2013 by Chris. On holidays up north and I have a couple of photos that include a contrast in age. I could collect more… nah, I’ll share them right away. 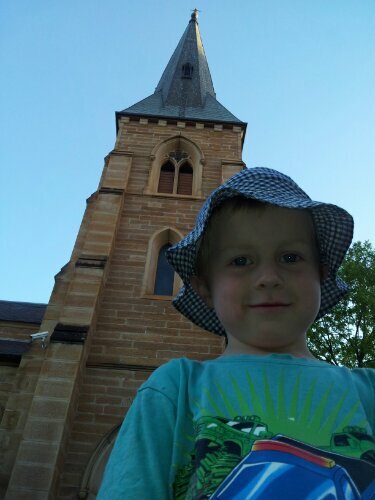 A five year old Joash mixes it with All Saints church building, North Parramatta. All Saints was built on land bequeathed by Samuel Marsden. If I remember the sign correctly, it was completed in 1845. At the Sydney Cricket Ground for the final test of the summer, we are all greeted with a new gaping hole. There is a definite absence of Noble and Bradman Stands. 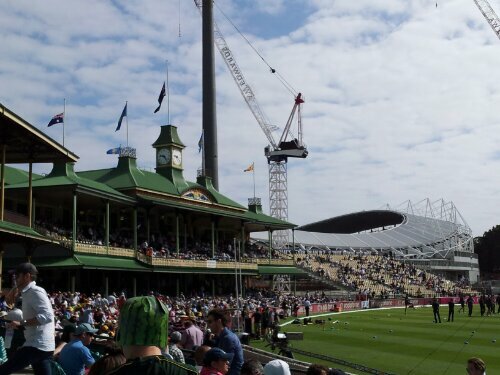 The temporary gap allows a fascinating contrast: the old Members’ Stand and the much newer Sydney Football Stadium. I think they provide a pleasing, and surprising, complementary image. This entry was posted in Family on 3 January, 2013 by Chris. A Saturday, 20 June 1992. 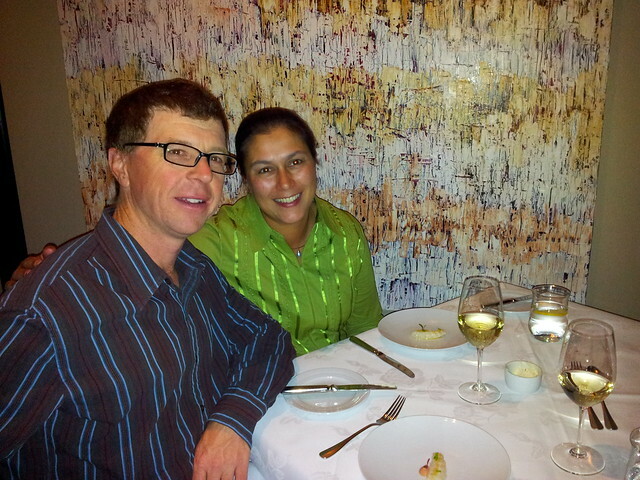 This entry was posted in Family and tagged Anniversary on 21 June, 2012 by Chris. There’s a freeway through Albury! That’s old news. But it’s a good road. Especially, I’m sure, for the 4000+ truckies who go through everyday on the road between Melbourne an Sydney. I have an affection for the road. Not only is it good, but it helped us buy a house. With construction close to commencement, there was not one competing offer on the house we live in. If there was, we would have been out-offered. While building went on, we took some photos. Attempting roughly the same shot about once per month, still photos were taken from September 2005 to January 2007. I’ve put them into a morph video. 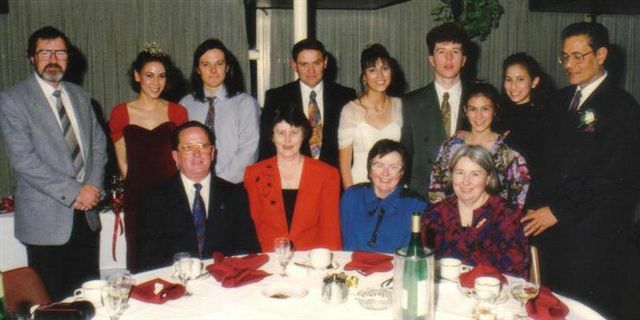 This entry was posted in Family and tagged Albury on 10 June, 2011 by Chris. In this post, I put in writing my personal aim in ministry. This ‘PS’ to the original post is to mention a couple of indirectly-relevant matters. They would have over-lengthened the original piece. Is this aim too result-driven? Specifically, does it depend upon each of my children becoming model Christians? I’m sure you’ve met fine Christians whose children have chosen not to trust Christ. Does that mean they failed in ministry? And if a parent has believing children, do we simply say, ‘They must be good at ministry – see their kids’? For a start, my aim is to pass on the message. To pass on a gift is different from receiving the gift. I avoided saying ‘to make my children believe’, for example. I think that the words in bold would be better translated ‘his children are faithful’. Meaning, ‘faithful to him’ and therefore not rebellious against his right authority. Hence, they’re not to be uncontrolled (debauched) or anti-authority (insubordinate). In any case, it’s clear that Paul says: when appointing an elder, include a look at his relationship to his kids. Is this an excuse to neglect other church people? In other words, can I now use my ministry aim as a crafty excuse not to visit the new-comer, or to prepare well for Bible study? To truly pass on the gospel of Jesus, I have to show that the kids are not ‘gods’, or idols. I need to show where they are in the world: created, God’s image, amongst many neighbours whom God loves, fallen, urged to repent, called to serve, etc. Doing this makes it necessary to say, ‘I can’t read that book now, because I need to do regular preparation/respond to this urgent call.’ It makes it necessary to show what it is to be generous and give, to even bear a cost in following Jesus. It means I want to help the whole church grow in Christ, with them blessed by being part of it. So, no, I don’t believe this ministry aim provides excuses for poor care for the church. This entry was posted in Family, Ministry on 7 May, 2011 by Chris. I don’t know how many times I have heard the question. I also don’t know how to give an answer that is useful or helpful. It’s not the aim to deceive – merely that I am in the wrong position to give a considered answer. I’m too close to it all. But I can, at last, say something: my ministry aim. It’s taken a long time, but I finally can express it. And I think it’s unexpected. It’s unexpected because my aim is not obviously tied to the employment in ministry. My aim is not to grow Albury Bible Fellowship Church (though I do work to that end). Nor is it to plant more FIEC churches (though, again, I do work for that outcome). It’s not even to have lots of MTS ministry apprentices (though I sure love working with such trainees). Rather, my Christian ministry aim is: With the help of my wife, to pass on the gospel to my children. This involves teaching, prayer, discipline, time, comfort, training, … Everything usual in biblical gospel ministry. My desire is that they are better informed about God’s word than I am. That they are more faithful and self-disciplined in living out this word. That they are more amazed at God’s love than I am, and love their neighbour better than I do. Here’s some of the thinking behind this. The ministry cliché – which I don’t buy – is ‘family first, then church.’ The reason for this cliché is to avoid the family breakdown caused by minister putting church demands first, so I get it. The problem: it assumes, and therefore perpetuates, the model of inherent conflict between church and family. Remember also that God is our Father. So if I totally mess up fatherhood, I will be so much less able to teach people about God. I feel as if I’ve put myself on the line a little bit here. But that’s good! I can already think of the follow-up post I will write. I also know I will prayerfully need to keep thinking through this whole matter all my life. But it’s where I stand, and what I currently think. What are your thoughts? What suggestions do you have, what problems do you see? I’m interested to know. This entry was posted in Family, Ministry and tagged Church, Family, Ministry on 6 May, 2011 by Chris. This is not in any way to disparage those who do the job. I regularly tell people that teaching and looking after children are fantastic jobs for Christians: loving input into little lives at most influential stages. What a joy and responsibility! It’s simply that this is a role for all, paid or unpaid. I’ve seen a similar idea inside churches, too. Someone mentioned that home school families – of which we are one! – are not available for church events. Notice the assumption? Input by parents/family into the lives of their children is not contributing to church. To do real church work I need to run youth group, or something. This entry was posted in Family, Ministry on 23 August, 2010 by Chris. There’s a better map, and a profile of the ride, on this page. Great work! They did well, well enough to be tired. Being tired helped the memories – they both fell over once (Ruth not noticing us slowing down at give way sign, Nahum while we were standing still at traffic lights 15m from the finish). Next challenge – 50km plus. 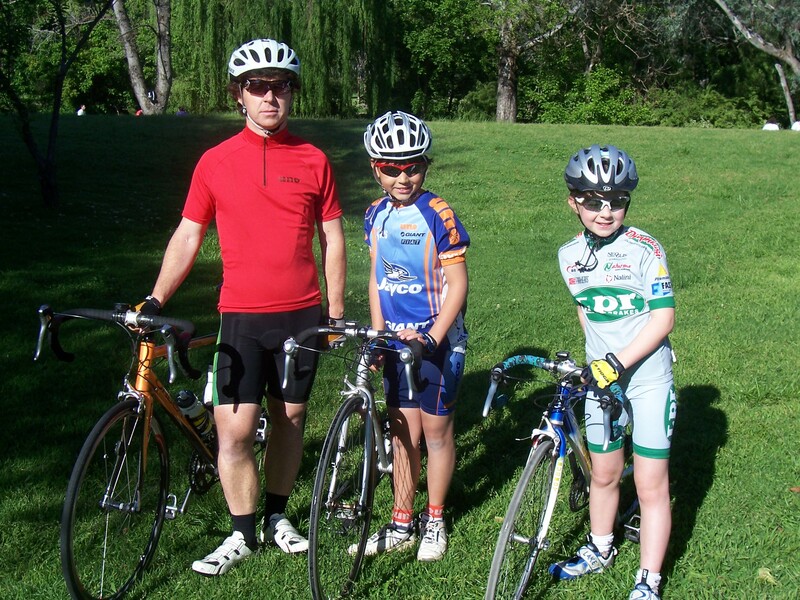 This entry was posted in Cycling, Family on 3 November, 2009 by Chris.